We all know how excited kids get when they see THEIR names written on anything… key chains, chocolate bars, backpacks, folders, the list goes on. 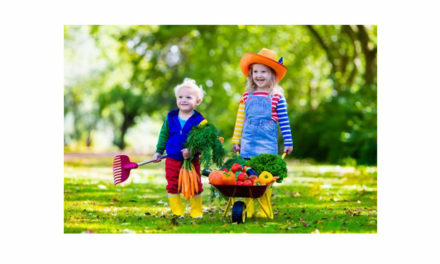 We have put together a list of our top sites so you can grab the best, personalized gifts for the children in your life. And what’s not to love about a gift that also helps your grandchildren keep track of what’s theirs. 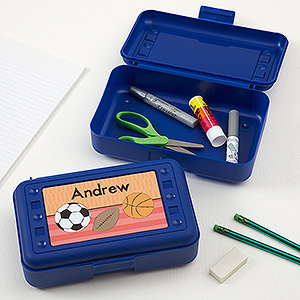 Just for him/her personalized pencil box– Let them organize their school supplies with this Just For Him Personalized Pencil Box. Their first name will be printed across the front in a choice of 4 design options (sports, dinosaurs, robots, automobiles) to be sure no one messes with their school supplies. Makes a perfect box for pencils, pens, scissors and much more! Get it here! 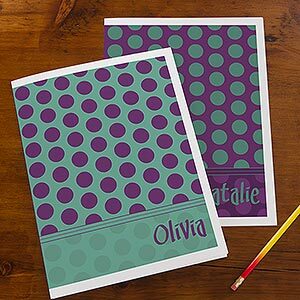 Trendy Polka Dots Personalized Folders– These super fun Trendy Polka Dots Personalized Folders are perfect for school or home! They will be the envy of their classmates with their very own personalized folders to store homework, class notes, or even the lines to their role in the school play! Aside from its practical use, each folder comes personalized with any name so there’s no confusion on whose folder it really is. Get it here! Discovery Lunch Box- This BPA- and PVC-free, glow-in-the-dark lunch box is made from the same tough packcloth as Discovery Backpacks in matching colors and bold, bright graphics. 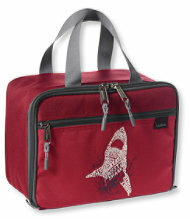 Each lunchbox can be personalized with monogram so that there’s no confusion in the lunch line on whose bag is whose! Get it here! 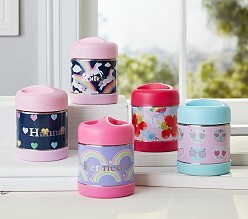 Hot & Cold Containers– Keep soups and cocoa hot, or lemonade cold while on the road with these sturdy containers featuring summery prints. Print the kids’ names right on the front, then there won’t be any confusion on who gets what! Get it Here! Printed Sleeping Bags- Perfect for every sleep over at Grandmas! 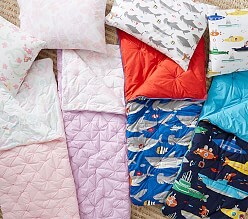 Personalize a cozy, kid-sized sleeping bag, quilted for a plush night’s sleep. In playfully bright patterns, they’re a must-have for movie nights, overnights or any night! Get it here! Monogramed Medium Jewelry Box- Carved with delicate details on the outside, this charming jewelry box opens to reveal a mirror and a dainty fairy ballerina with sparkles and wings. Get it Here! 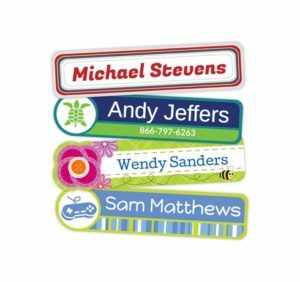 Rectangle label stickers- One of Name Bubbles most popular labels due to the oodles of style options and their staying power, these waterproof name labels are perfect for labeling school supplies, sports equipment, and items headed to school or daycare. Get it here! 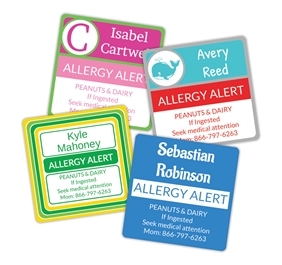 Allergy Alert Labels- Name Bubbles personalized Allergy Alert Labels will keep your child’s allergy front and center with eye-catching colors and styles. Get it here! Thanks & Giving = Thanksgiving!